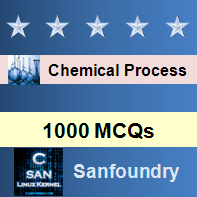 This set of Chemical Process Calculation Multiple Choice Questions & Answers (MCQs) focuses on “Kinetic and Potential Energy”. Explanation: Energy a system possesses because of its velocity relative to the surrounding is Kinetic Energy. Explanation: A resting body have no velocity and kinetic energy. 3. A 5 Kg body is having a Kinetic energy of 250 J. What is the velocity of the body? Explanation: K.E. = mv2/2 . 4. What is the specific kinetic energy of a particle, having a velocity 5 m/s? Explanation: Specific Kinetic Energy = v2/2. 5. What is the unit of Specific kinetic energy? Explanation: Specific kinetic energy is kinetic energy unit mass, Unit is J/Kg. 6. Water is pumped from a storage tank through a tube of 4 cm inner diameter at the rate of 0.002 m3/sec. What is the specific kinetic energy of the water in the tube? Explanation: Specific Kinetic Energy = v2/2, v = Flow rate*Area of the tube. 7. Energy a system possesses because of the force exerted on its mass by a gravitational or electromagnetic field with respect to a reference surface. Explanation: Potential energy is the Energy a system possesses because of the force exerted on its mass by a gravitational or electromagnetic field with respect to a reference surface. Explanation: Specific potential energy = gh. 9. A mass is at 30 m of height from its reference point. What is the specific potential energy of the mass? Explanation: Specific potential is the potential energy of the unit mass. 10. What is the potential energy of a 2 kg mass having a height of 40 m from its reference point.